Large Popcorn, No Butter: The Babadook: Nightmare Fuel. As most horror movie fans would probably agree, finding a well-made scary movie can be a little harder than you might think. Churning out blood and guts (sometimes quite literally) can be done by any idiot with a camera and some corn syrup. But instilling actual fear? That's something that requires a bit of finesse. The Babadook, an Australian film garnering more and more attention, is one of these films. Full disclosure: I don't think he's funny. The plot follows a mother, Amelia, and her son, Samuel. Samuel is having some behavioral problems that are interfering with his classmates, his cousin, and (most markedly) his mom. He has a pathological fear of monsters, which prompts him to make numerous homemade weapons, frighten those around him, and makes it nearly impossible for him to sleep. Despite Amelia's attempted patience, there's a tangible exhaustion that totally envelopes her character. She's dealing with the grief of having lost her husband in a car accident seven years before (incidentally, on their way to the hospital to have Samuel) and her son's antics are driving her up the wall. It only gets worse with the arrival of a mysterious pop-up book in her son's book case. 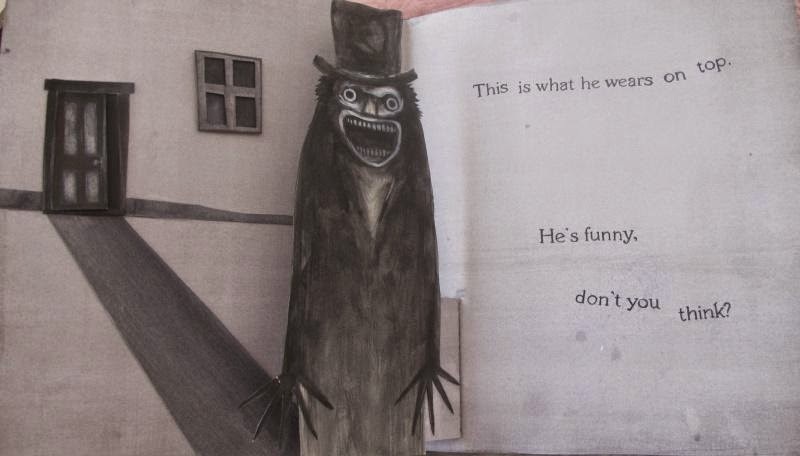 A book that tells of a man called Mr. Babadook, and shows images of him watching you, waiting to be let inside, and finally, forebodingly, ends that once you've seen him you'll "wish you were dead." At first denying the existence of this creature, the mother begins to hear and see strange things at night. As things gets more eery, the Babadook starts to affect their lives and their relationship. But is the Babadook real? Or is it a manifestation of the mother slowly losing her sanity? Is he in that closet tho..? The Babadook is really interesting in that it blends psychological and supernatural horror in a way that hasn't been done this gracefully, to my memory, since The Shining. While you want to believe that there are supernatural powers at work, there is also a tangible slip in Amelia's psyche as she becomes more and more blunt and antisocial. Honestly, for the first half of this movie, all I could think was "This poor woman." Her son's unacceptance of the idea that there is no monster almost makes you feel hopeless. But then when he ends up being right (or does he?) you're immediately conflicted with whose side to root for. Is Amelia just at her breaking point? Is the Babadook a supernatural manifestation of her emotions? Or is he simply a monster like the child's been saying all along? In terms of technical specs, the cinematography is on point. This is where, I might add, a lot of B-horror movies screw things up. Too many long shots, bad dialogue, sloppy editing, and dozens of other things can turn a horror movie into a nightmare (heh, see what I did there?). Director Jennifer Kent goes out of her way to give you some great jumps and fantastic creeps without sacrificing artistry. And, like all worthwhile scary movies, it has a way of manipulating sound that totally will creep you out. In their too-quiet house, Sam's outbursts are more irritating, his mother's silence more resounding, and the sounds of their intruder incredibly scary. 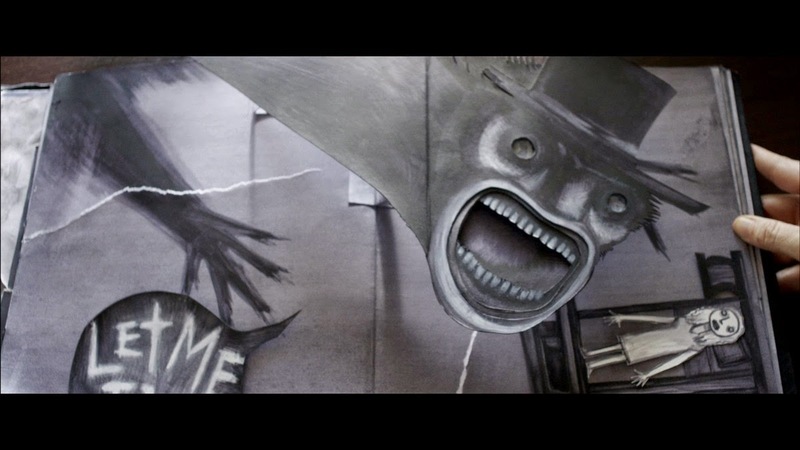 In a lot of ways, The Babadook reminds me of a few Asian horror movies that I've seen. A lot is left unexplained, and a lot relies on mystical realism, but that is part of what makes it so good. It's not an episode of Scooby-Doo, where the monster is revealed and you can go home with a sense of closure. It ends leaving you on your toes. After all, you can't get rid of the Babadook. Great, great, great. 8 outa 10. This was such a nice surprise. I had not heard of it until later in the year (2014) and was really impressed. It sets itself up to be a familiar horror flick, but I loved the different things it did.